Facility for mass cultivation of orchids and farmers’ training hostel buildings were inaugurated at the picturesque bio-resources park of Institute of Bio-resources and Sustainable Development (IBSD), a central institute in Manipur at Haraorou village, 16 km north of Imphal on Thursday. Manipur Governor Dr Najma Heptulla and director of IBSD Prof Dinabandhu Sahoo attended the inaugural function. Many scientists of the institute were also present on the occasion. Addressing the programme, Dr Najma Heptulla appealed to the people to be friendly with the nature as only then the nature will be friendly to human being. Terming the location of the IBSD bio-resources park as a serene place, Dr Heptulla also shared a brief account on how the Raj Bhavan in Imphal where she resides regains birds, butterflies and nature’s beauty. Dr Heptulla also expressed the need to take up cash crops cultivation with valued addition activities in an effort to realise the Prime Minister’s initiative to double the farmers’ income. “We can buy rice from anywhere but we cannot buy orchids and medicinal plants (of the region). We are proud of having our rich biodiversity and we should preserve it,” she said. On the other hand highlighting the activities of the institute in transforming the existing bio-resources park from its previous conditions, Director Prof Sahoo said that the park located at the foothill fields of Haraorou village measuring around 40 acres, could be a hub for orchids in the near future considering the requirement of the population. “The idea of developing the mass cultivation of orchids comes when people started to use imported plastic orchids for the social gatherings,” he said. The facility at the IBSD park will provide lakhs of cut orchids annually. So far 750 orchid entrepreneurs from the NE region have been trained at 10 different villages of the state, he added. Around 500 orchid species grow in the Northeast out of 900 orchids reported in the country. 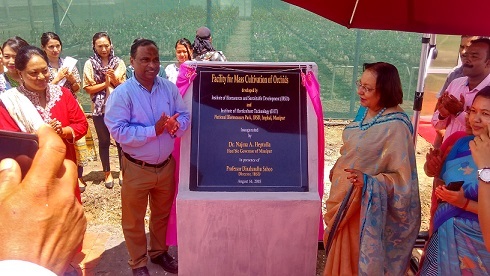 On March 14 this year, Prof Sahoo accompanied by scientists of the institute had inaugurated a fish hatchery complex having portable facilities besides dedicating the foundation stone for the development of a tissue culture and hardening facilities inside the park.